You’re gonna love this ultimate appetizer! Bacon Jalapeno Popper Pretzel Bites are filled with gooey cheese, crispy bacon, and jalapeño peppers for the best party bite! Ok, you’re not going to believe this one! 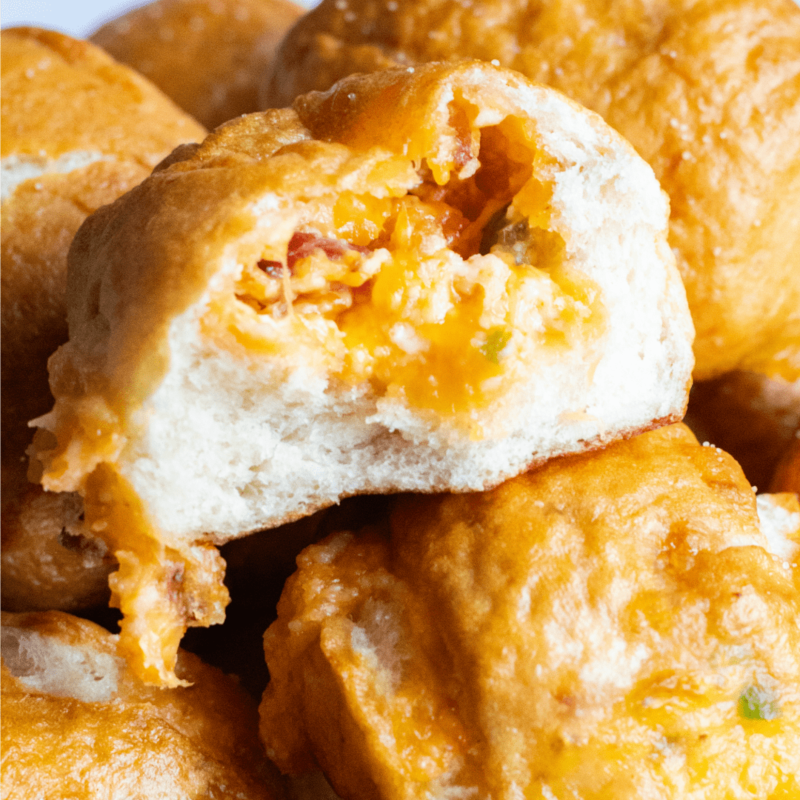 Freshly baked dough, stuffed with cheese, bacon, and jalapeños to create the ultimate appetizer. Yes, you heard right! My guys could NOT believe their eyes, I think I spied a little drool too, when they saw a plate of these yummy Bacon Jalapeno Popper Pretzel Bites coming their way! 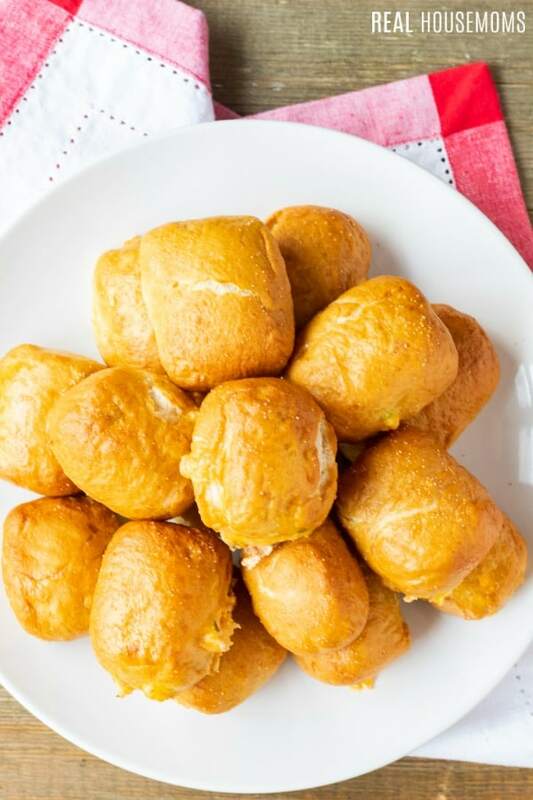 They didn’t have their mouths empty until the plate was empty, but as soon as they were done everyone was exclaiming, “Oh man, these are good!” These easy pretzel bites are perfect for all your parties! Couldn’t you picture serving these up for game day, a backyard BBQ or anytime you have hungry friends coming over?? In our case, family game night seems to be a good time to break out this recipe. They’re a zesty bunch and also love these Jalapeño Popper Topper Crackers. 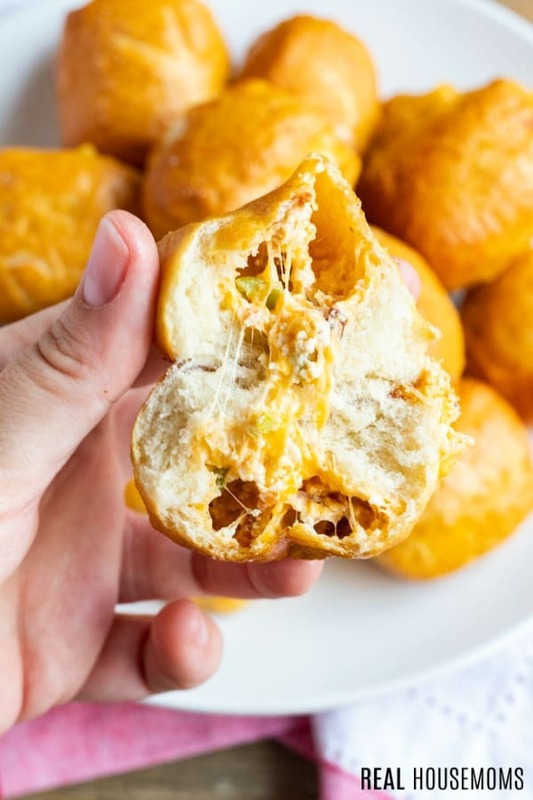 The process for making these Bacon Jalapeño Popper Pretzel Bites starts with the dough and making it is pretty simple if you have a stand mixer with a dough attachment. However, you can also make the dough by hand (see note below). 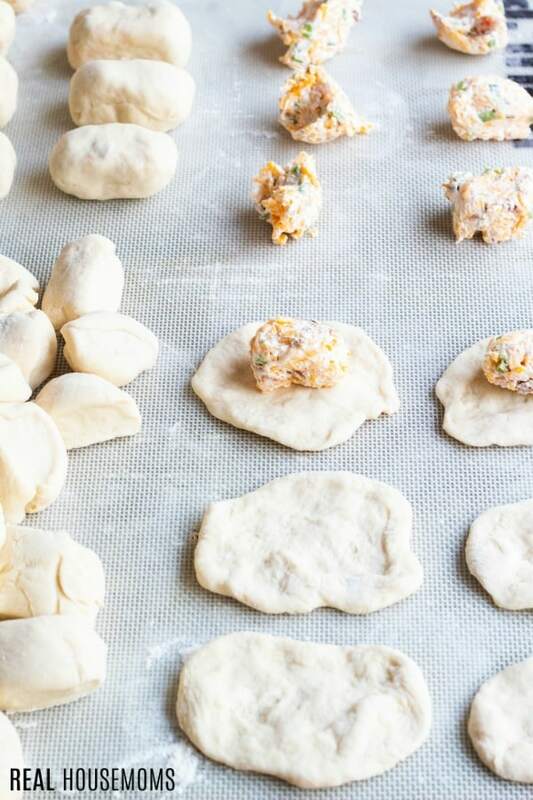 Once you have your dough made, you get to create 36 cute little dough balls that become your pretzel bites by stuffing them with your cheesy, bacon jalapeño mixture, and placing them in the hot baking soda water. Yes, there’s a little bit of chemistry going on with your baking soda water, but go with it as it’s how you get a soft chewy pretzel with a golden brown exterior and that distinctive pretzel flavor you love! Make sure your water is about 110-115 degrees F. If it’s too hot, your yeast won’t bloom as it’s supposed to. To make the dough by hand, just add water, yeast, and sugar to a large bowl. Once the yeast blooms stir in your salt and flour. Mix with a spatula. Then, place dough onto a floured countertop and knead for 3-5 minutes until dough is no longer sticky. Proceed with the remainder of the recipe. You could certainly make these bites bigger or smaller depending on the size of your crowd. Ranch dressing makes a nice dipping sauce for these scrumptious bites! Marinara works too. Want more bacon jalapeno recipes? Rolling Mat: This mat is the best! Easy countertop clean up, it doesn’t slide or shift, and easy to transport doughs. I especially love being able to lift it to help get cut-off cookies off the mat easily. You're gonna love this ultimate appetizer! 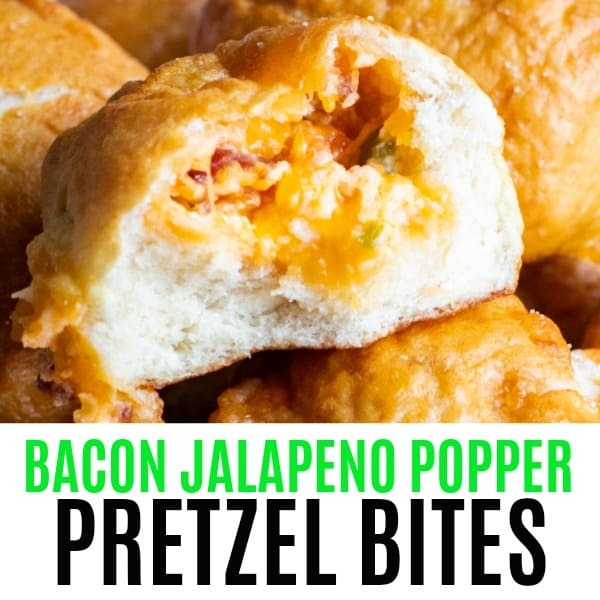 Bacon Jalapeno Popper Pretzel Bites are filled with gooey cheese, crispy bacon, and jalapeño peppers for the best party bite! Preheat oven to 400°F. Line two baking sheets with parchment paper or silicone mats. Add flour and salt to stand mixer. Knead for 3-5 minutes until the dough comes together in a ball. If the dough is sticky, add more flour a tablespoon at a time. The dough should be tacky, but not sticky when you take it out of the mixer. Place dough on floured counter top and knead in flour for a minute or two until it's no longer tacky. Form dough into a ball. 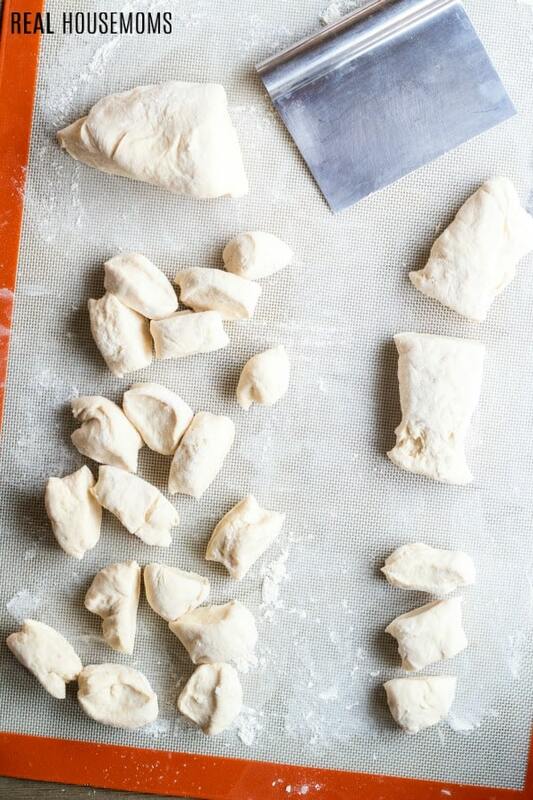 To make 36 fairly even pieces for stuffing, cut dough ball into quarters using a pastry cutter or butter knife. Roll each quarter into a thick log and cut that into 3 pieces. Roll each of those pieces into a log and cut into 3 more pieces. When you are done you will have a total of 36 pieces. 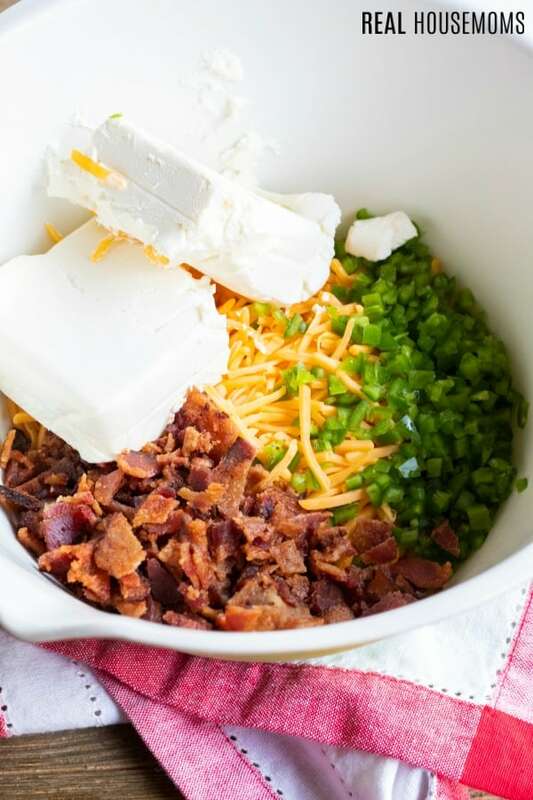 In a medium bowl, mix together cheeses, bacon, and jalapeños until completely combined. Divide the cheese mixture into scant 1 tablespoon portions. Form each portion into a tater tot shape. Roll each piece of dough into a ball and then flatten into a rectangular shape. place one cheese mixture portion in the center of the dough. Carefully pull the sides of dough over the cheese and pinch edges closed. Form the dough into a rectangular-ish bite shape. Repeat until all 36 bites are stuffed and shaped. Bring water to a simmer in a medium pot. Once hot add the baking soda (the water will foam up, it's okay). Add 4-6 pretzel bites to the water at a time. Boil for 30 seconds being sure to turn the bites so all sides are coated. Remove to the prepared baking sheets. Repeat until all pretzels have been boiled. Arrange pretzel bites so they are not touching, then sprinkle with kosher salt. Bake for 18 to 22 minutes until the bites are golden brown. (Some of the filling may ooze out a bit during baking.) Carefully remove from the oven and transfer to a wire rack to cool. Serve warm or at room temperature. If fresh jalapenos are not available, you can substitute one 4-ounce can of diced jalapenos.